US Senator Chris Dodd, who received more than $280,000 in campaign contributions from re/insurance giant AIG and whose wife was appointed to the board of a Bermuda subsidiary of the firm, will leave office in January free from investigations or prosecution. The Connecticut Democrat’s controversial ties with AIG and its one-time Bermuda affiliate IPC Holdings Ltd. contributed to his decision not to seek re-election this year because Senate committees he was a member of regulated the American financial services sector. On December 20 the US Senate Select Committee on Ethics — commonly known as the Senate Ethics Committee — dismissed an ethics complaint filed against outgoing Senator Christopher Dodd by the US watchdog group Judicial Watch. Judicial Watch’s specific complaint alleged that Senator Dodd assisted a longtime friend and associate, Ed Downe Jr., to obtain a reduced sentence and ultimately a full Presidential pardon from Bill Clinton for tax and securities crimes, in exchange for gifts, including a sweetheart mortgage deal that he failed to properly disclose on his Senate Financial Disclosure forms. Sen. Dodd was elected United States Senator in the elections of 1980 but chose not to seek re-election for a sixth term at the November elections because of a slew of ethics allegations. His campaign warchests were heavily subsidised by the financial services industry – which was regulated by committees Sen. Dodd either chaired or sat on in the Senate. His reputation never recovered from a US economic stimulus bill amendment he introduced in February, 2009 ratifying hundreds of millions of dollars in bonuses to executives at AIG executives at a time when the beleagured company was receiving billions of dollars in bailouts from Washington. AIG has had a major off-shore presence in Bermuda for more than 50 years and aside from its main operation on Richmond Road, Pembroke operates a number of Bermuda-based subsidiaries. Of the $285,238 in donations he received from AIG, Sen. Dodd took in more than $223,000 from the insurance firm’s employees — many of whom were Connecticut residents — after they were encouraged to donate to his campaigns by senior executives (the “boss asked everyone at AIG. Financial Products ‘to contribute the maximum to Dodd, because he was so important in Washington in terms of regulating the products we sell’,” the “New York Times” magazine reported last year). “Even if it is legal, can someone tell us why this isn’t corruption?” asked one commentator of the AIG employee contributions. ”Does anyone who was in that room not think that they were buying influence? 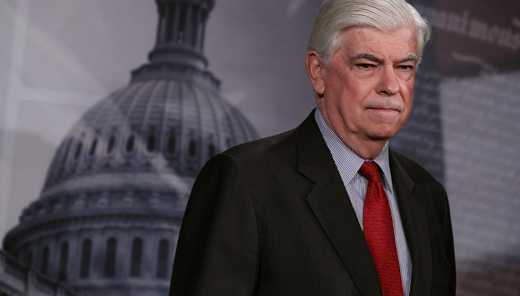 It is really credible to believe that Chris Dodd would walk out of that room without a feeling of indebtedness to AIG? Yet, incredibly this is just considered the standard way to do business in Washington. Additionally, it was revealed last year that Sen. Dodd’s wife is a former director for Bermuda-based AIG subsidiary. AIG sold its interests in IPC in August, 2006.